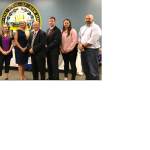 On June 1, 2018, eight new Lean Black Belts graduated from the NH Bureau of Education and Training’s Lean Program. The Lean Black Belt program includes both classroom education and training course work combined with extensive project development and implementation. The students work with a mentor to receive guidance and feedback along their journey. The NH Lean Executive Committee congratulates the recent graduates on their accomplishment!